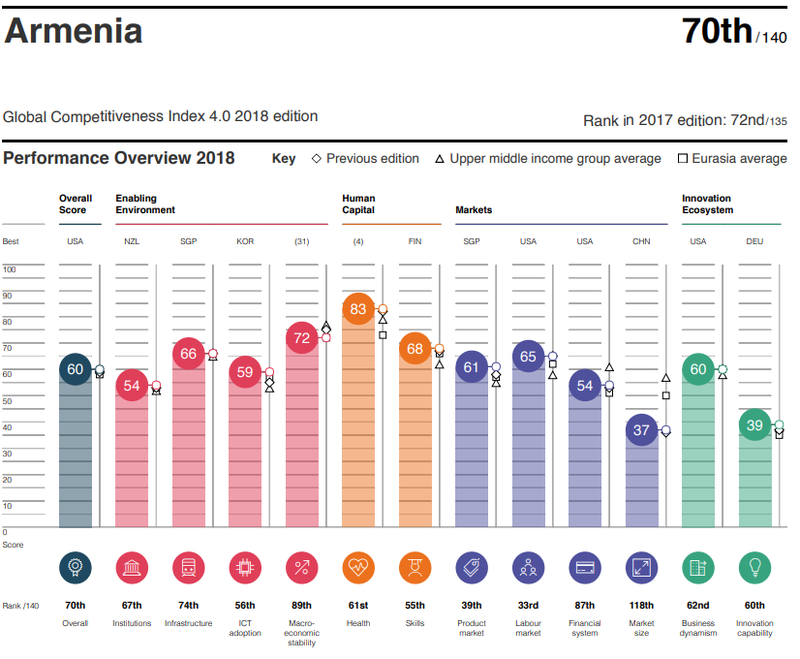 Armenia is ranked 70th (up from 72nd last year) among 140 countries in the Global Competitiveness Report 2018 released by the World Economic Forum (WEF) today. Armenia’s partners in the Eurasian Economic Union Russia and Kazakhstan are ranked 43ed and 59th respectively. Kyrgyzstan is 98th, no data is available about Belarus. Armenia’s neighbors Georgia and Azerbaijan are placed 66th and 69th respectively, Turkey is 61st, Iran is 89th. The WEF assesses the world’s biggest economies across almost 100 different indicators, from the quality of infrastructure to life expectancy and the jobs market. The Geneva-based organization has added several new metrics to its 2018 study, such as workforce diversity, press freedom and how hierarchical the biggest companies are in a particular economy.